Yay It's Friday!! This week we have my special bloggy friend Melissa Peda of 100 Billion Stars chatting to us. Melissa and I met ages ago through our mutual love of all things Sis Boom and other Free Spirit fabric designers. 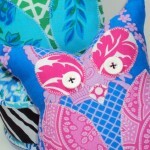 She amazes me with her crafty creativity and her intuitive affinity for fabrics and colours. She's the queen of fussy cutting and a general all round wonderful person. I'm sure you'll enjoy getting to know her as much as I have. Hi Melissa, tell us a bit about yourself? I've been sewing for over 30 years. I suppose that says a lot about how much I love fabric. I use the tiny dining room of our small house as my "studio" and fabric, quilts and projects spill over into every room. 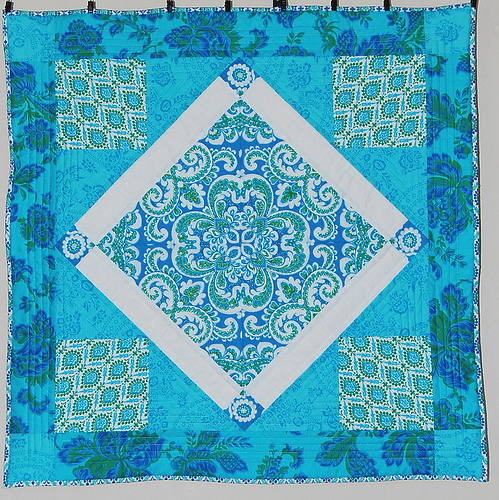 I design quilts and lifestyle projects, write patterns and blog about all my crafty craziness. I'm so delighted to have an outlet for my creative ideas and a place to share my adventures. 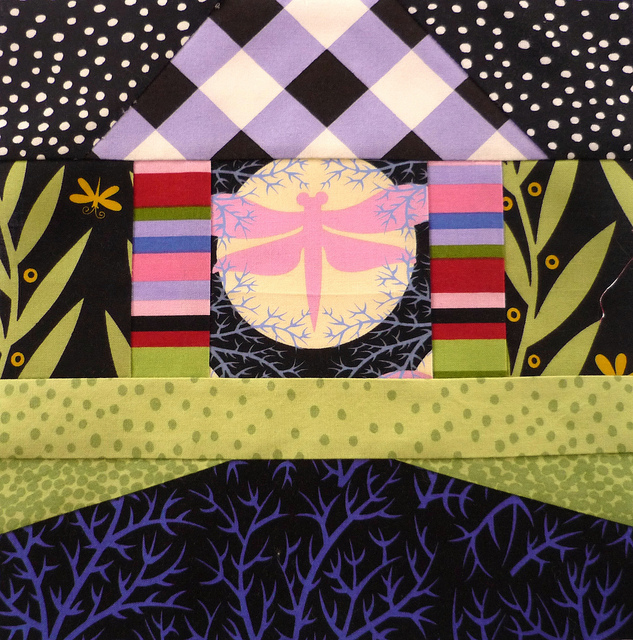 My first quilts were made around 1990 when quilting fabric lacked the vibrancy we enjoy today. After a couple of quilt tops, I gave up. There just wasn't any joy there for me. Then, in 2007 I stumbled on Jane Sassaman's fabrics. 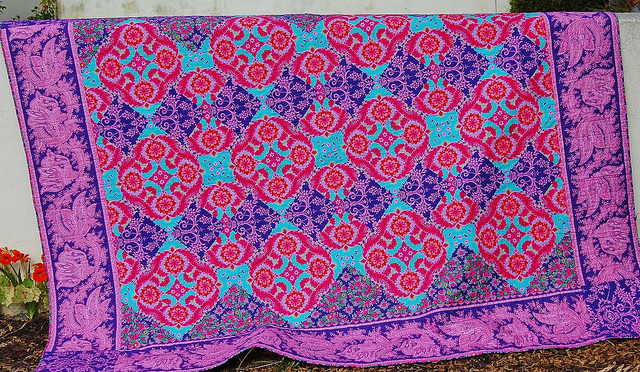 I bought some yardage and made a quilted wall hanging. I haven't looked back since. Definitely the variety of fabrics available. The saturated colors, the whimsy, the mismatched look--all of it drew me in. 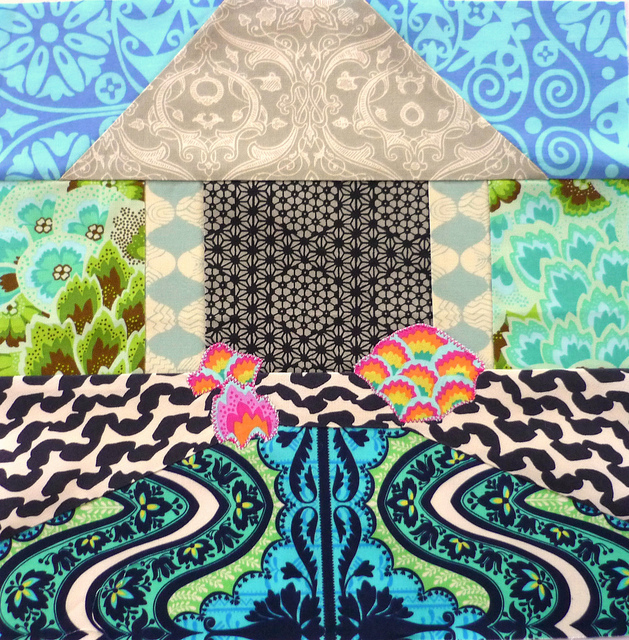 I love to play with design motifs, cutting them up and recombining them into new and unexpected patterns. 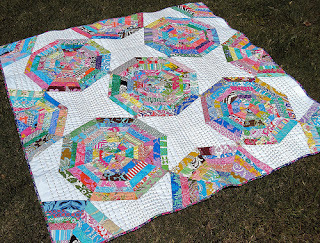 Quilts are the perfect embodiment of that type of play. And the color. I love playing with the color. The actual quilting is probably my least favorite part. Unless it's hand quilting. Then I don't mind at all. "Measure twice, cut once." Actually my father, a carpenter, taught me that one. I have a Bernina 350 PE but still get use out of my 21 year old Bernina 1000 workhorse. Often, but not always. I pick the music to suit my mood. Currently, if I need to work more quickly, it's The Black Keys or The Fumes. If not, I might pull out Adele or even Florence and the Machine. My taste in music is eclectic so there's always something to fit the occasion. Tough question! Mexican, Thai, Indian--I could eat those all the time, any time. But if I have to pick one thing I can't live without, it would be coffee. That's food, right? 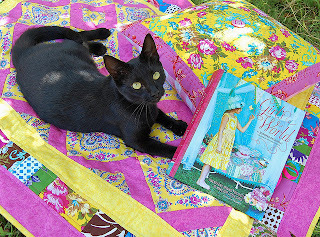 Two friendly neighbor kitties make sure that I take frequent breaks from sewing. Tell us about the house blocks you've made? This was my first house block ever. I wanted something different, something you could look at and say, "Oh that's Melissa P!" I wanted it to represent me in style, not just fabric choices. I started with the idea that the foreground should be broken up and lead your eye to the front door. 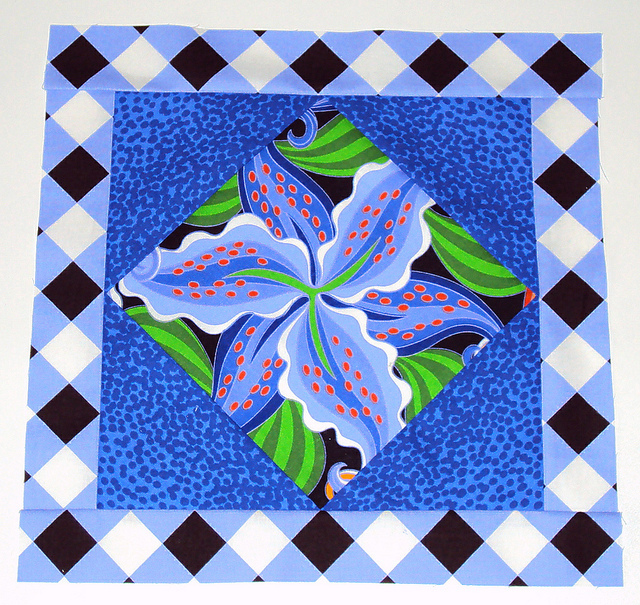 From there, it took on a life of its own, resulting in a block that can be easily customized by anyone to represent their style and fabric favourites. This house is perfect for Amy and David Butler stylish swirls. Wow! Thank you Melissa, these are 3 very wonderful houses!! Pop over to Melissa's blog ,100 Billion Stars, to see what she's been up to. Her work has been appearing in various magazines recently so you'll most likely be seeing her name here, there and everywhere. WOW! What a talented lady! Thanks for sharing some of her story! All three house blocks are wonderful but I think the "Butler" one is my favourite! Off to check out her blog! What great fabrics! Love the house blocks - you lucky thing! What a cool girl! I went to her site and love her luggage tags as well! 3 blocks that are all awesome. 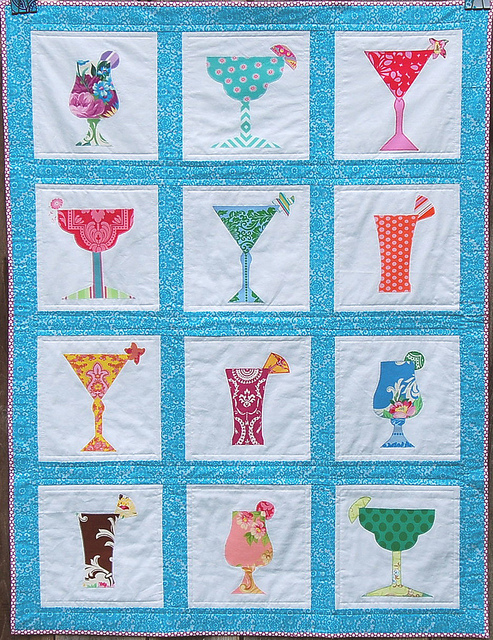 I love how she used the Amy Butler fabric for the walkway. The is going to be such a fun project for you. Another great interview Rachael...and yes of course coffee is food! Thanks for sharing your talented friend with us! Melissa sure has a fresh creative style! Thanks for introducing us to Melissa! What a talent! Another great profile & love the houses! 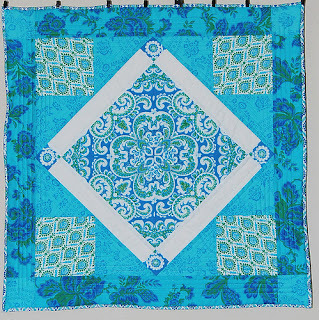 Thanks for introducing another talented quilt maker! 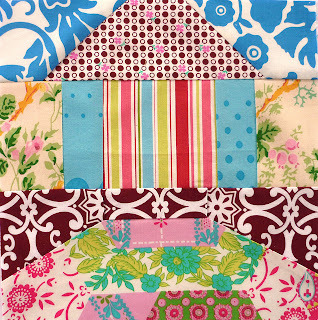 I love the way she uses the fabric designs in the house blocks. I'm off to her blog right now! Awww, thanks Rachael! I'm so grateful for your friendship. And for the Internet for giving us the opportunity to make new friends in far places. I'm anxious to see your quilty neighborhood come together. It's going to be amazing. Three beautiful houses, but I must say I love the Amy Butler one, the fabric at the bottom of the block is absolutely perfect to lead your eye to the house. I love the dragonfly in the third house too. 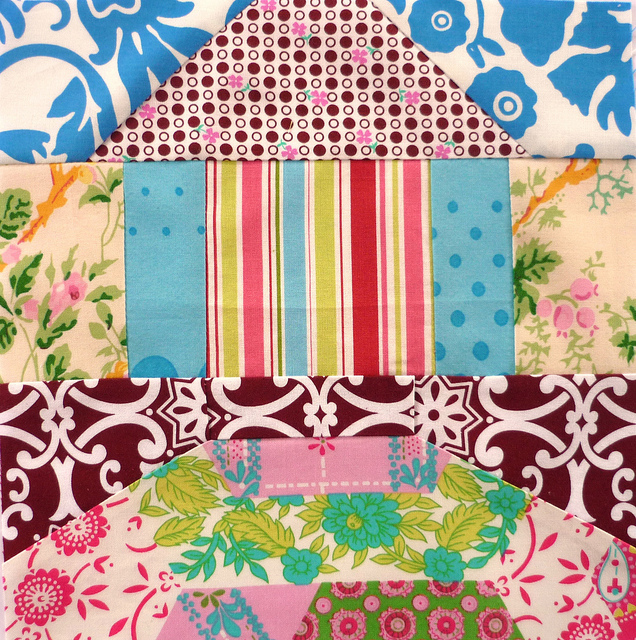 What absolutely fabulous blocks! Lucky girl you are. I always read the interview and try to imagine what the blocks will look like. It is very tempting to skip to the end to see the blocks and then go back and read the interview. But for once I restrain myself and do it properly. I can only imagine how excited you were opening your mail. Another great Friday interview. 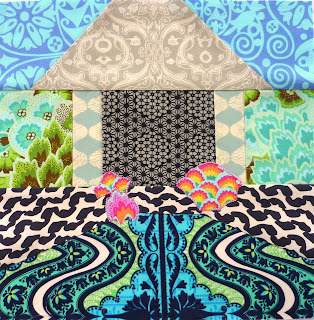 This House Quilt is going to be just so amazing!! 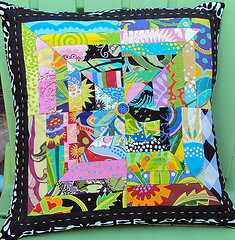 I love that Spiderweb quilt. (You knew I was going to say that didn’t you?) 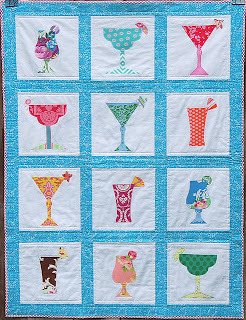 And the cocktail quilt is just darling! Melissa is one talented lady.